Festool rarely has sales, and never sells reconditioned tools; but that is all about to change next month. 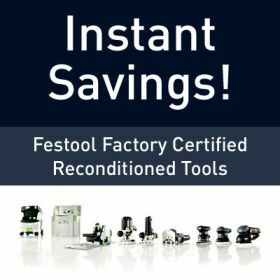 Starting in February, and it looks like only in February, Festool will be selling off their supply of reconditioned tools. Reconditioned tools will either have a 10% discount or 20% depending on the condition of the tool; but you should be happy to know that all tools have been inspected by Festool service technicians and meet Festool's standards. All tools will carry a one year limited warranty, and will be covered by a 30-day guarantee. Visit Festool for more information.